Your body needs vitamin C, a water-soluble vitamin, to manufacture collagen, which is a structural component of cartilage, ligament, tendons, blood vessels and skin. The vitamin also helps heal wounds and repair your bones and teeth. Vitamin C comes in many forms, including chewables, capsules and tablets. The University of Maryland Medical Center suggests taking vitamin C tablets two to three times per day with meals, depending on the dosage. It also advises to use these supplements only under the supervision of your doctor. According to the UMMC, consistently using vitamin C tablets and not just when you get sick shortens the length of the cold by about a day. A study published in the July 2007 issue of "The Cochrane Database of Systematic Reviews" says that though a vitamin C tablet does not appear to exert its effect in the normal population, it may reduce the risk of catching a cold in people exposed to short episodes of cold environments or very intense exercise. UMMC reports that 500 milligrams of vitamin C when taken along with other antioxidants such as 400 IU of vitamin E, 15 milligrams of beta carotene and 80 milligrams of zinc may help protect your eyes from getting age-related macular degeneration, or AMD. UMMC further says that the benefits of their combined use seem evident in people with advanced AMD. However, more research needs to be done to determine their effectiveness in people with less advanced AMD. 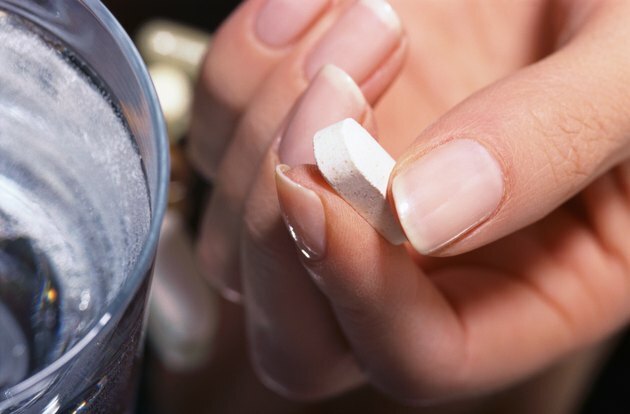 Because this combination of nutrients includes high concentrations of zinc, you should consult your doctor before taking these supplements, UMMC cautions. Women who are at high risk of pre-eclampsia may benefit from taking a vitamin C tablet along with vitamin E, notes UMMC. Pre-eclampsia, which is a leading known cause of premature births, is distinguished by excess protein in the urine and high blood pressure. Still, not all experts agree on this role of vitamin C supplements. According to UMMC, taking vitamin C may boost immune system function, improve gum health and alleviate dry mouth. Consuming vitamin C tablets may also help treat allergy-related conditions such as hay fever, asthma and eczema. The supplements may lessen the effects of sun exposure such as redness or sunburn. Taking vitamin C may also help people with uveitis improve their vision. However, more research is required to judge these beneficial effects of vitamin C tablets because of limited information.